This new study confirms everything that Afrocentrists deny about Caucasoid admixture in East (and South) Africa. 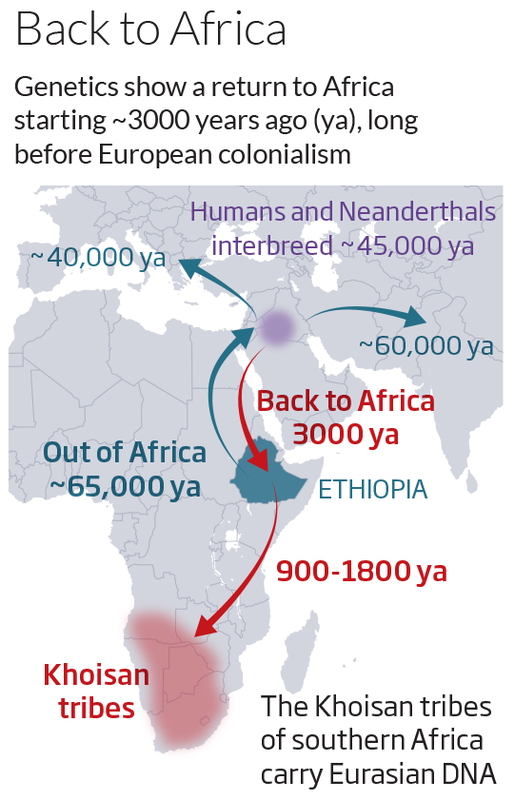 A major open question concerns the initial source of the west Eurasian ancestry in eastern Africa. 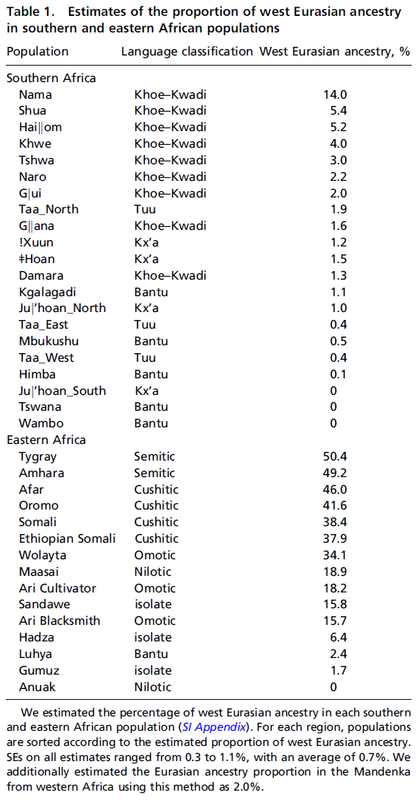 The estimated mean time of gene flow in eastern Africa is around 3,000 y ago, and the amount of gene flow must have been quite extensive, because the west Eurasian ancestry proportions reach 40-50% in some Ethiopian populations (Table 1 and ref. 10). Archaeological records from this region are sparse, so Pagani et al. (10) speculate that this admixture is related to the Biblical account of the Kingdom of Sheba. However, archaeological evidence is not completely absent. During this time period, architecture in the Ethiopian culture of D'mt has an "unmistakable South Arabian appearance in many details" (19), although there is some debate as to whether these patterns can be attributed to large movements of people versus elite-driven cultural practices (19, 20). Additionally, linguistic evidence suggests that this time period was when Ethiosemitic languages were introduced to Africa, presumably from southern Arabia (21). It is perhaps not a coincidence that the highest levels of west Eurasian ancestry in eastern Africa are found in the Amhara and Tygray, who speak Ethiosemitic languages and live in what was previously the territory of D'mt and the later kingdom of Aksum. A second question is, which population or populations introduced west Eurasian ancestry into southern Africa? 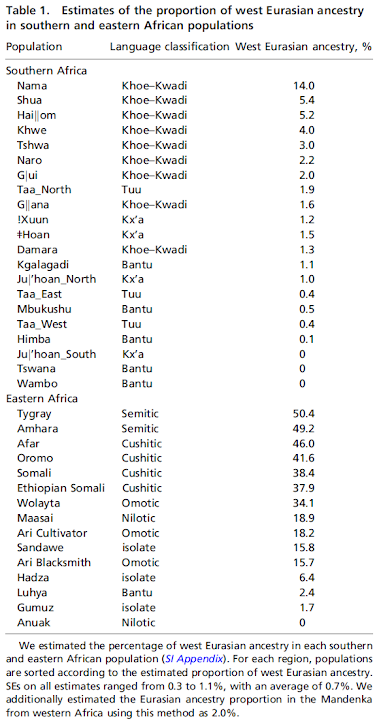 The best genetic proxy for this ancestry that we have found is the west Eurasian ancestry in eastern Africa (Fig. 1C), and although we do not identify modern east African populations as the best source population, this is likely due to the lack of genetic drift specific to eastern Africa (SI Appendix, section 1.2.3). The most parsimonious explanation for this observation is that west Eurasian ancestry entered southern Africa indirectly via eastern Africa (the alternative scenario of direct contact with an unsampled west Eurasian population cannot formally be excluded; however, there is no archaeological, historical, or linguistic evidence of such contact). The relevant eastern African population may no longer exist. However, such a migration has been suggested based on shared Y chromosome haplotypes (12, 22) and shared alleles/haplotypes associated with lactase persistence (2, 23) between the two regions. Furthermore, based on a synthesis of archaeological, genetic, climatological, and linguistic data Güldemann (13) hypothesized that the ancestor of the Khoe-Kwadi languages in southern Africa was brought to the region by immigrating pastoralists from eastern Africa. Our observation of elevated west Eurasian ancestry in Khoe-Kwadi groups in general (Table 1) is consistent with this hypothesis. Based on these analyses, we can propose a model for the spread of west Eurasian ancestry in southern and eastern Africa as follows. First, a large-scale movement of people from west Eurasia into Ethiopia around 3,000 y ago (perhaps from southern Arabia and associated with the D'mt kingdom and the arrival of Ethiosemitic languages) resulted in the dispersal of west Eurasian ancestry throughout eastern Africa. This was then followed by a migration of an admixed population (perhaps pastoralists related to speakers of Khoe-Kwadi languages) from eastern Africa to southern Africa, with admixture occurring ~1,500 y ago. Advances in genotyping DNA from archaeological samples may allow aspects of this model to be directly tested. Pickrell et al. "Ancient west Eurasian ancestry in southern and eastern Africa". PNAS, 2014.